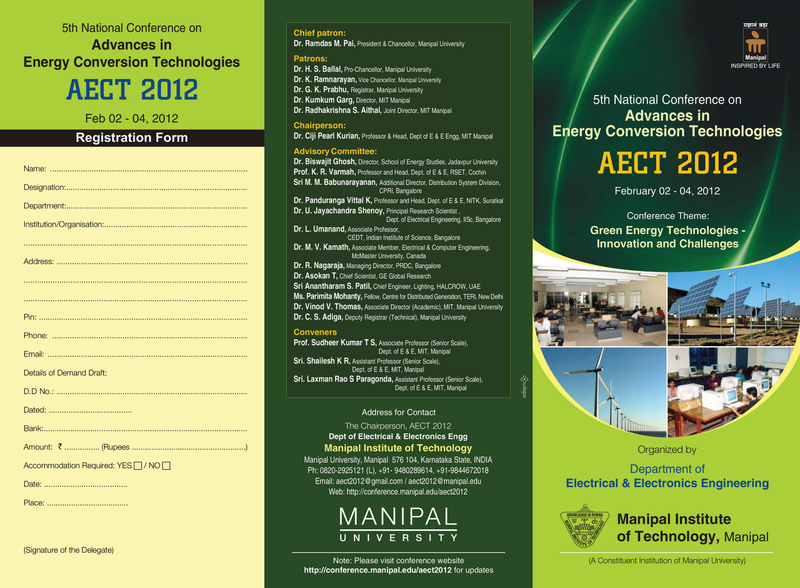 The Department of Electrical and Electronics Engineering of Manipal Institute of Technology is organising “Fifth National Conference on Advances in Energy Conversion Technologies (AECT 2012)” from 02-04 February 2012 at MIT, Manipal. The theme of the conference is “Green Energy Technologies – Innovation and Challenges”. This is the fifth conference of a regular series of national annual conferences being planned to bring together professionals and executives in the energy sector, electrical power companies, manufacturing industries, research institutes and educational bodies to share and exchange ideas and information pertaining to green energy technologies. Consistent to the conference theme, in AECT 2012 we invite original contributions from researchers, educators, managers and students to submit articles, which may be conceptual, theoretical, or empirical in nature. They may document research activity, case studies or best practices, shedding light on the theory or practice of engineering, technology, or innovation. The original contributions from the authors are invited in the following. Udupi is a very old temple city that is famous for its SriKrishna temple, established by Madhvacharya, the founder of the Dvaita philosophy. It had a nascent career as a financial hub till the 60s, with many banks being established here, but most of them got nationalized. Manipal within Udupi city is an important educational and medical centre in Karnataka. Its the second largest city in Coastal Karnataka after Mangalore Udupi City at present has Manipal, Malpe and surrounding areas as its suburbs. Full day pre-conference tutorials on specialized areas of Electrical and Electronics Engineering will be conducted by eminent academicians and industry experts on 2nd February 2012. All the registered delegates can attend these tutorials. All delegates planning to attend the conference must register by paying the registration fee. At least one author of each accepted paper must register for the conference for the paper to be included in the conference program. Only one paper will be considered for presentation against each registration. Limited hostel accommodation is available. This will be arranged ONLY for academic participants/research scholars on first come first serve basis at no extra charge. For industrial participants accommodation will be arranged in hotels in and around Manipal and Udupi on prior request, along with payment of hotel room rent in advance through a separate DD.